Siunčiantis didelius .torrent failus kartais reikia ilgai laukti failo parsiuntimo. Kartais šis procesas užtrunka net iki 3 valandų. Tačiau mes turime Jums pasiūlymą. Atsisiuntus BitComet“ priedą, programa padidins Jūsų torentų siuntimų greitį. If you’ve been plagued by slow downloads on BitComet, you’ll know how few options there are to speed it up. Sure, you can increase the bandwidth throttle and re-configure some of the parameters but you won’t get much joy. 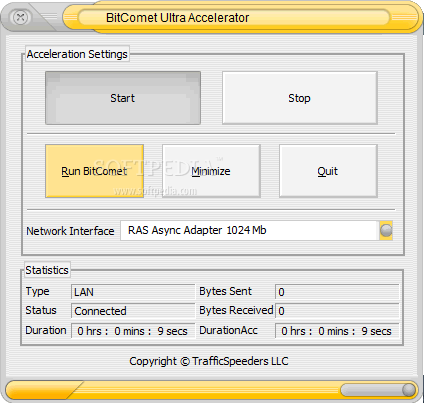 BitComet Ultra Accelerator is a pleasant surprise however. It will noticeably speed-up your BitComet connections and also ensure that you get more reliable downloads. It works by allowing you to instruct BitComet to search for more sources at user-specified intervals. In this way, you get more control over when BitComet searches for seeds. On a user level, the interface is simple to use – there’s not much more to it than clicking „Accelerate“ once you’ve configured it as you want. You can also minimize it to the system tray so it operates discreetly. One added bonus is that it allows you to automatically resume paused downloads and it resumes downloads from the last shut-down. The only drawback is that it doesn’t seem to speed up all downloads. Those that have plenty of seeds definitely run faster but those with limited seeds show little difference.